Five editions is a lot! If you had told me, back when we wrote the first edition, that some day we would write a fifth; I would have wondered how we could possibly find that much to say. After all…it is supposed to be The Little SAS Book, isn’t it? But those clever folk at SAS Institute are constantly hard at work dreaming up new and better ways of analyzing and visualizing data. And some of those ways turn out to be so fundamental that they belong even in a little book about SAS. That’s especially true of this edition. SAS 9.3 introduced several fundamental changes. So we rewrote the book to reflect these. One of the new defaults is that output is rendered as HTML instead of text. That meant that almost every section in the book needed to be updated to show the new default output. And since text output still has its uses, we added a section on how to send output to the good old LISTING destination. In addition, ODS Graphics has matured a lot since it was introduced with SAS 9.2. It has new default behaviors, and is now part of Base SAS. The fourth edition of our book included a few sections on the SG procedures (SG stands for Statistical Graphics), but these procedures have developed so much that we felt they now deserved their own chapter. In addition, here and there we split sections in two or added new ones to expand on features that were only mentioned before. Along the way, we removed topics or sections that had begun to feel dated or out of place. For example, we took out the appendix on Coming to SAS from SPSS because it is now available as a free download that is both better and more complete. So even though we have added a lot to this edition, it is still a little book. In fact, this edition is shorter than the last—by one whole page! To order a copy of this book, or view the table of contents or a sample of the book, visit the SAS Press web site. I don’t know who wrote this, but I like their way of taking something ordinary and injecting it simultaneously with humor and profundity. 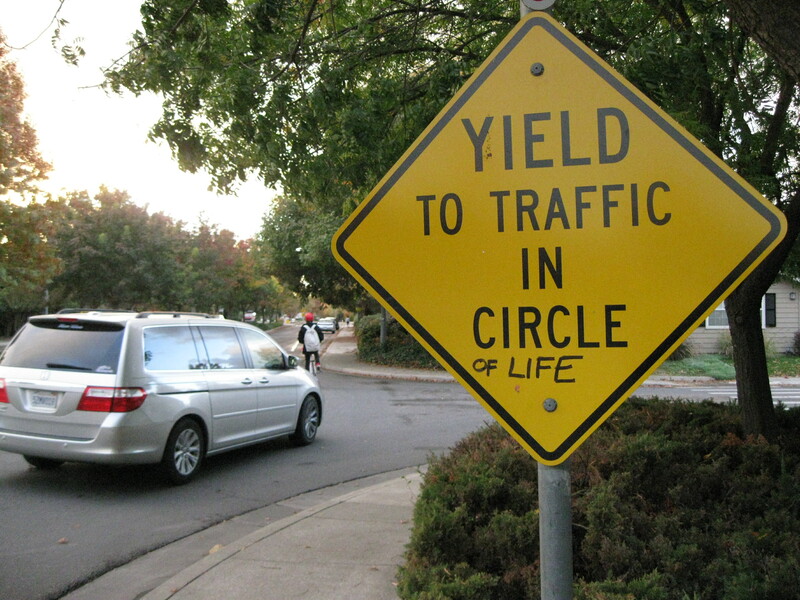 For a while now you might say that I have been yielding to traffic in the Circle of Life. But the traffic seems to be thinning out these days, and I have a backlog of half-written posts. With a little luck, I hope to be moving along in the Circle of Life and have more to say in the future.